April 30th is National Adopt a Shelter Pet Day. This day was created to raise awareness of the thousands of pets living in shelters that are waiting for adoption and permanent homes. As I write this post my buddy Cooper, our latest rescue dog, is on the couch beside me snoring away. His predecessor was also rescued from a shelter. We were fortunate to call Sydney ours for nearly 16 years. When she was put to sleep, I swore it would be a long time before another one graced our doorstep. I lasted all of one month before needing to fill the space she left in our lives. All of you pet lovers out there know what I'm talking about. Today I'm sharing poems about some pets lucky enough to find their forever homes. 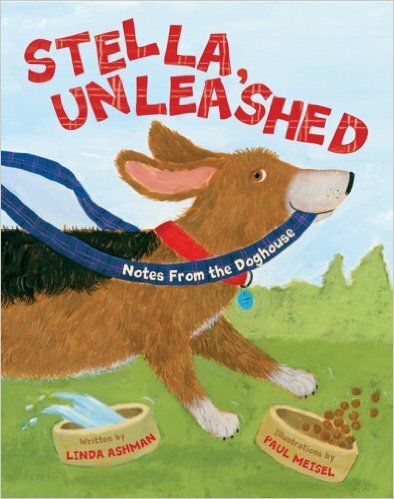 Stella, Unleashed: Notes From the Doghouse (2008), written by Linda Ashman and illustrated by Paul Meisel, is a collection of poems told from the point of view of Stella, a dog rescued from the pound and brought to live with a family. 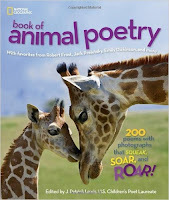 The poems cover topics as varied as her rescue from the pound, selecting a name, the family members, other pets, eating, sleeping, the dog park, and more. and sniffed them all . . .
Nice enough but not quite right. dirt and candy, grass and cake. I stuck my paw out for a shake. That's how I chose this family. I dive like a sub. but not in the tub. Poems ©Linda Ashman, 2008. All rights reserved. 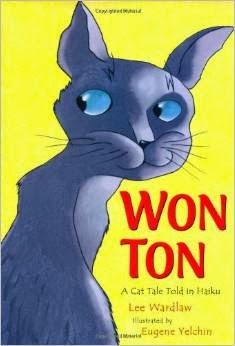 Won Ton: A Cat Tale Told in Haiku, written by Lee Wardlaw and illustrated by Eugene Yelchin, is the story of a shelter cat and how she acclimates to her new home, told entirely in senryu. Won Ton's story is divided into sections, including The Shelter, The Choosing, The Car Ride, The Naming, The New Place, The Feeding, The Adjustment, The Yard, and Home. No rush. I've got plans. wish: Please, Boy, pick me. Dogs have hair. Cats, fur. Dogs whine, yip, howl, bark. Cats purr. Poems ©Lee Wardlaw, 2011. All rights reserved. 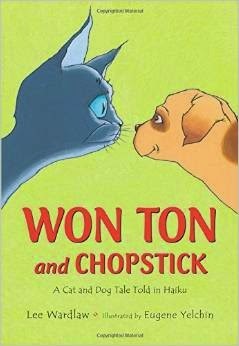 Won Ton and Chopstick: A Cat and Dog Tale Told in Haiku (2015), written by Lee Wardlaw and illustrated by Eugene Yelchin, is the sequel to Won Ton: A Cat Tale Told in Haiku. In it, Won Ton again narrated and shares with readers what life is like with a new and annoying puppy in the house. Belly low, I creep . . . peek . . . FREEZE! guessed. It must be . . . Pest! Poems ©Lee Wardlaw, 2015. All rights reserved. 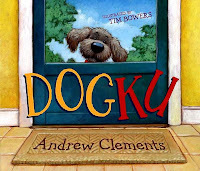 Dogku (2007), written by Andrew Clements and illustrated by Tim Bowers, is the story of a stray dog told through a series of 17 haiku. While not about a shelter dog, it is about a pet in need of a home. The story begins with this poem. The door is opened and the dog welcomed in. Eventually he earns the name Mooch and becomes a part of the family. Here are two additional poems. Scratch, sniff, eat, yawn, nap. Dreams of rabbits and running. There are words and words and words. Poems ©Andrew Clements, 2007. All rights reserved. The PBS series Martha Speaks produced a nice list of books about dogs, including shelter dogs. 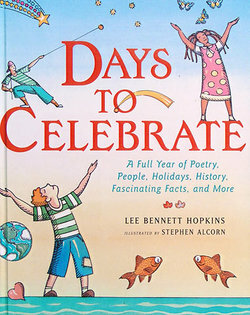 Well, that's a wrap for this year's National Poetry Month project. I hope you've enjoyed exploring celebrations with me. Check out the NPM 2016 Celebrations page for a complete listing of this month's posts. April 29th is Arbor Day, a day dedicated annually to public tree-planting in the US, Australia, and other countries. In the United States it is celebrated on the last Friday in April. Trees are so important. They provide us with two things we cannot live without: food and oxygen. They also offer the added benefit of serving as a source for shelter, beauty, and a wealth of wood products. Just how many trees are there in the world? In thinking about trees today, I'm sharing snippets of poems in a form borrowed from Wallace Stevens. You'll recognize it as Thirteen Ways of Looking at a Blackbird. From Pear Tree by H.D. of rain on these old cherries. 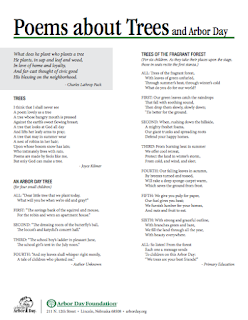 Here's a handout of poems about trees from the Arbor Day Foundation. That's it for today. I hope you'll join me tomorrow for our last celebration of the month. I can't believe it's almost done. 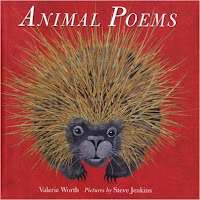 Last week I shared the poem After Reading a Child's Guide to Modern Physics by W.H. Auden. I'm still thinking about physics and poetry this week. If you haven't been here before, or haven't been following my National Poetry Month project, here are the posts from this week. Feel free to poke around. April 28th is National Blueberry Pie Day. I am not a fruit pie lover (sorry! 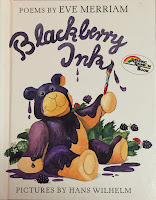 ), but I do adore the blueberry. Last summer I heard a terrific story on NPR about blueberry history in New Jersey and how the blueberry was bred and "tamed" into the version we all know so well today. You can hear that story at How New Jersey Tamed The Wild Blueberry For Global Production. I buy my blueberries when they are available at my local farmer's market. I'm lucky if I can get them home before popping one after another into my mouth. And really, isn't that what you want to do with sweet, fresh, juicy fruit? 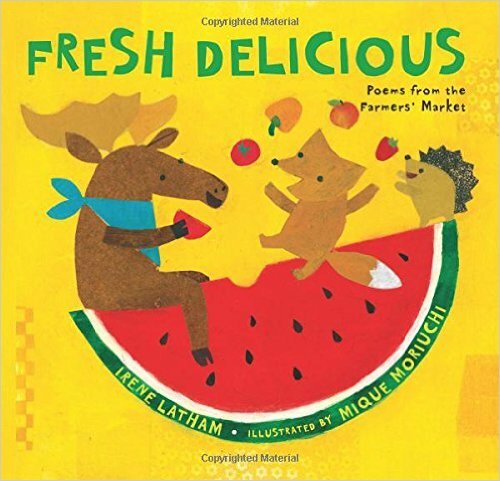 Fresh Delicious (2016), written by Irene Latham and illustrated by Mique Moriuchi, is a collection of 20 poems (21 if you count the back cover) about the farmer's market and the amazing array of produce you can find there. Poem © Irene Latham, 2016. All rights reserved. Yum! ¡Mmmm! ¡Qué Rico! 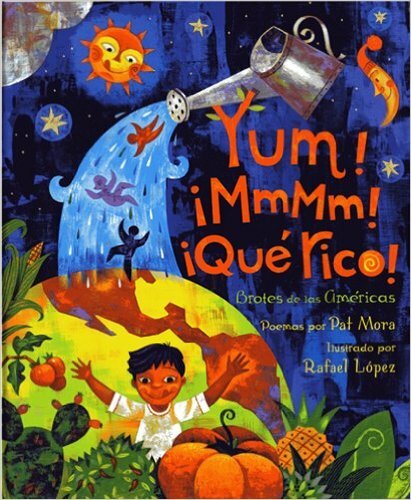 : America's Sproutings (2009), written by Pat Mora and illustrated by Rafael López, is a book that combines factual information about edible plants native to the Americas with crisp, sense-filled poems, all in the form of haiku. The foods are listed alphabetically, beginning with blueberry and ending with vanilla. Fill your mouth with blue. Share a bowl heaped with summer. Blueberries are delicious, healthy treats. Originating in North America, they were eaten fresh and dried by Native Americans. They also ground blueberries into spice rubs and used the berries in medicines. European settlers in North America made gray paint by boiling blueberries in milk, and today the United States is the largest producer of blueberries in the world. Wild blueberries, the official state berry of Maine, are sometimes harvested using traditional handheld rakes. Plan a blueberry party in July, National Blueberry Month. Poem and Text © Pat Mora, 2009. All rights reserved. Here's a long and lovely poem by Robert Frost. 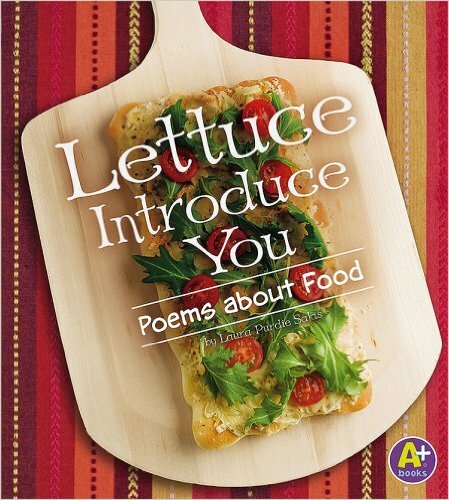 Lettuce Introduce You: Poems about Food (2008), written by Laura Purdie Salas, is a collection of food-themed poems that are written in a variety of poetic forms. Each poem is accompanied by a vibrant photograph. Next to blueberries in my hand, this poem describes my favorite way to eat them. What's he so happy about? Poem © Laura Purdie Salas, 2008. All rights reserved. In addition to blueberries on and in my pancakes, I do love a good blueberry muffin. My favorite recipe is this one for Jordan Marsh's Blueberry Muffins. This last poem isn't really about blueberries, but the imagery reminds me of them. Blackberry Ink (1985), written by Eve Merriam and illustrated by Hans Wilhelm, is a collection of poem for young children on a wide range of topics. Poem © Eve Merriam, 1985. All rights reserved. April 27th is Babe Ruth Day. On April 27, 1947, the Yankees hosted Babe Ruth Day at Yankee Stadium. The event was held to honor the ailing baseball star, who was in failing health due to throat cancer. You can read the New York Times article from the following day at On This Day. George Herman Ruth, Jr. (1895-1948), best known as "Babe" Ruth, was an American baseball player who spent 22 seasons in Major League Baseball playing for three different teams, the Boston Red Sox, the New York Yankees, and the Boston Braves. One of my favorite baseball movies is The Sandlot (1993). Here's a favorite scene side-by-side with the NY Yankees, in a commercial they did for the opening of the 2015 season. In it, the boys school their friend on just who Babe Ruth was. You can learn more about this commercial in this Inside Edition video. Let's start today with a poem sent to me by J. Patrick Lewis for this month's project. He’s American as Jell-o, apple pie, and ice cream cones. He’s synonymous with magic, miracles, and milestones. He’s the nemesis of Beantown where they hate him in their bones. Babe Ruth is marching on. To the spectators applauding for the Yankee head of state. Will the Sultan swat one out today? They won’t have long to wait. Like a bike with training wheels up against a Cadillac. He swings so hard you almost feel sorry for the air. The second strike is in the dirt. The Babe? He doesn’t care. But the umpire shrinks a little from the heat wave of his glare. Now here it comes, the best forkball the pitcher’s thrown all year . . .
Rainbowing to the right-field bleachers as a souvenir. That pill could make it hail throughout the Western hemisphere. Poem © J. Patrick Lewis, 2016. All rights reserved. Pat may not remember this, but he also sent me a baseball poem back in 2008. It's one of my favorite baseball poems. Poem © J. Patrick Lewis, 2008. All rights reserved. When I think of baseball poems in general, three come to mind. 1. Every year when spring training begins and on opening day, I read the poem Analysis of Baseball by May Swenson. Here's how it begins. 2. This poem that I memorized in middle school. It ends this way. 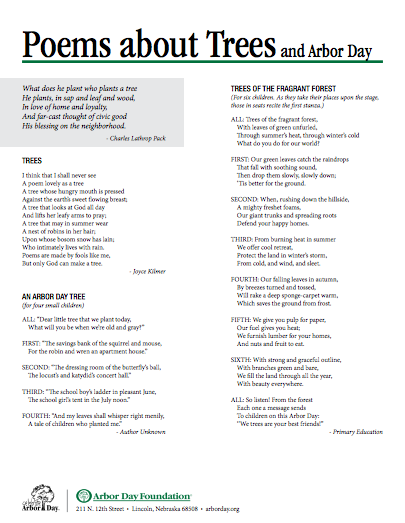 If you don't recognize it, the poem is Casey at the Bat by Ernest Lawrence Thayer. 3. I'm also quite fond of this poem by Ogden Nash. 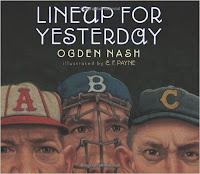 Line-Up for Yesterday: An ABC of Baseball Immortals was written for the January 1949 issue of SPORT Magazine. The poem pays tribute to 24 of the games greatest players. Here's how it begins. Creative Editions published this poem, illustrated by C.F. Payne in 2001. I'll wrap up with this poem by Franklin Pierce Adams. Else fandom shouteth: “Who said you could play? This is the end of every fan’s desire. 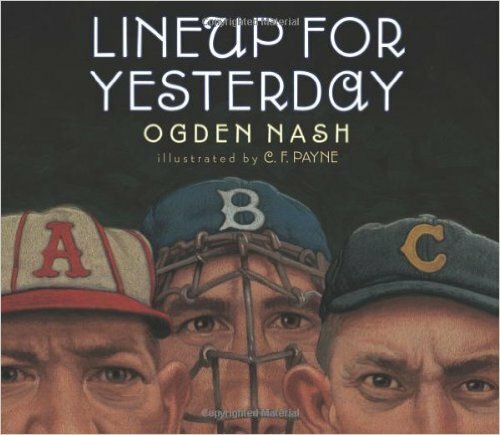 I've written numerous times about my love for baseball and about baseball poetry. Check out the post Poetry in the Classroom: Take Me Out To the Ballgame from 2011 and Poetry A-Z: Day 27 ... Baseball from 2013. You'll also find a wealth of baseball poems at the Baseball Almanac. Be sure to check out the poem Frosty and the Babe by John Robert McFarland. I'm ending today with this gem. April 26th is Richter Scale Day. 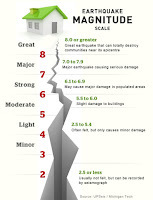 The Richter Scale is a numerical scale developed for measuring earthquakes by Charles Richter, a geologist at the California Institute of Technology. The Richter scale is a logarithmic scale that measures "magnitude" and reflects the amount by which the earth's crust shifts during an earthquake. 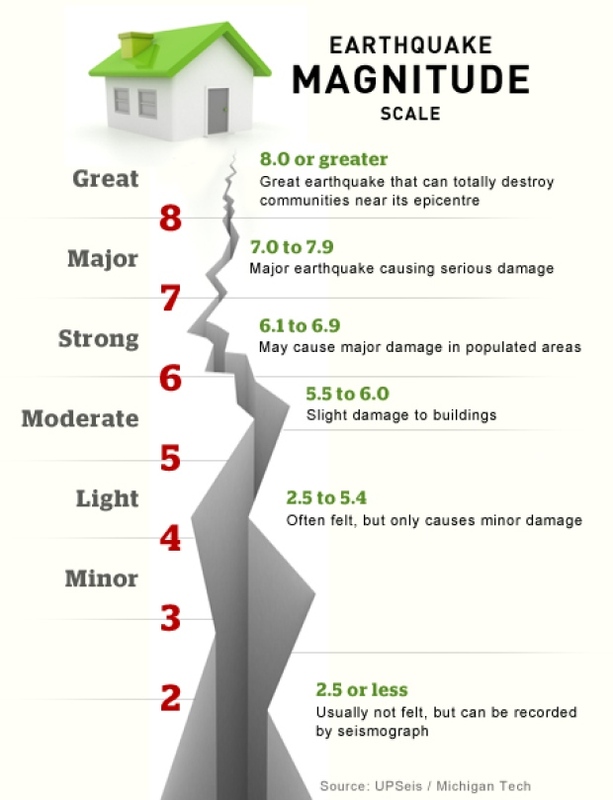 Because the scale is logarithmic, each 1-point increase on the scale represents an increase of 10x in the magnitude of the earthquake. Here's a simple chart to help understand the scale. Here's a bit more about the scale. 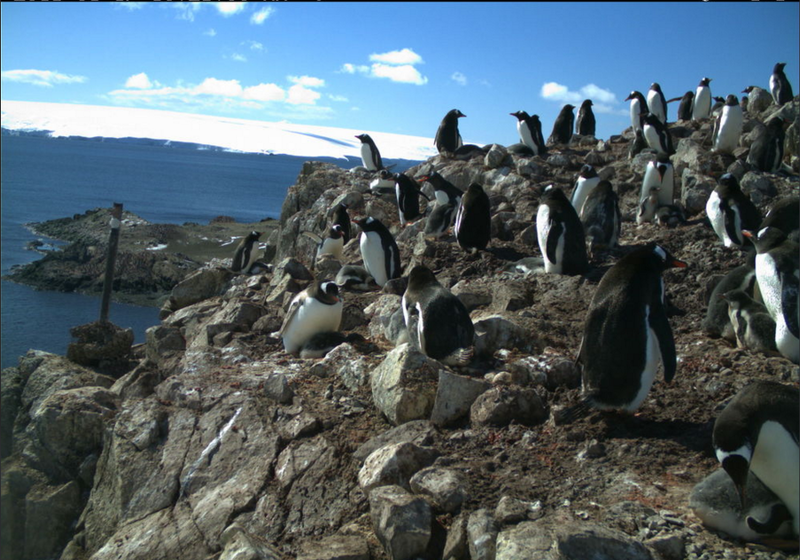 You can learn more about the science earthquakes at the USGS. 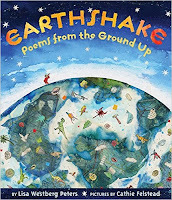 Earthshake: Poems From the Ground Up (2003), written by Lisa Westberg Peters and illustrated by Cathie Felstead, is a collection of 22 poems that introduces geologic concepts through metaphor and word play in a variety of poetic forms. A river crosses the San Andreas fault. out of the mud pots. 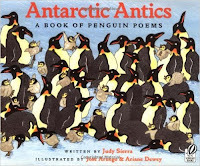 Poems © Lisa Westberg Peters, 2003. All rights reserved. 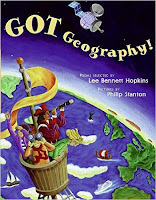 GOT Geography! 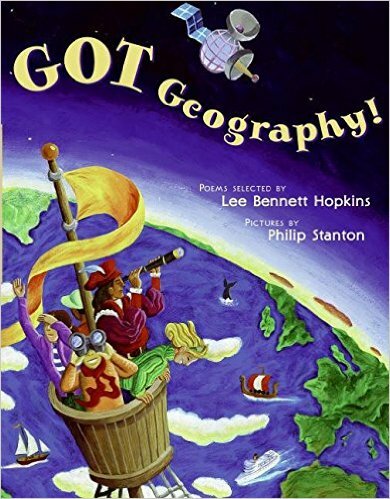 (2006), selected by Lee Bennett Hopkins and illustrated by Philip Stanton, is a collection of 16 poems about the geography of the earth, as well as ecosystems and features found on its surface. 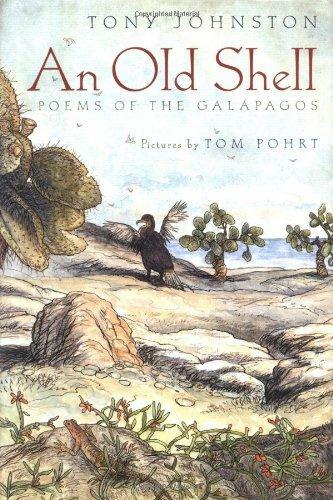 There are poems for islands, forests, mountains, the sea, and more. Poem © Joan Bransfield Graham, 2006. All rights reserved. 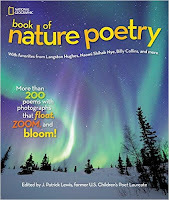 National Geographic Book of Nature Poetry: More than 200 Poems With Photographs That Float, Zoom, and Bloom! (2015), edited by J. Patrick Lewis, is a collection of classic and contemporary poems that celebrate the variety of life and landscapes on Earth. 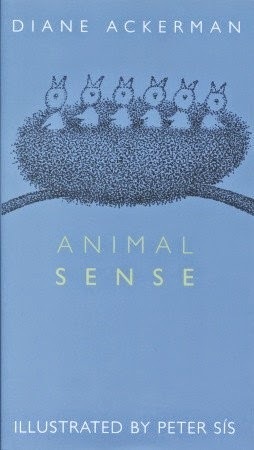 One section of this book is called In Distress. The poem below has some interesting formatting that I could not reproduce here, so be sure to click the image above to see what it's meant to look like. The loss is yours, the fault is mine. Among the rubble of despair. Poem © Mariel Bede. All rights reserved. You'll find the video poem Mother of Mothers around minute 7:58. The last full week in April (24-30) is Sky Awareness Week. This week provides us all with an opportunity to appreciate the beauty of the sky and to better understand the processes that make our weather. When I look at the sky during daylight hours, I think of clouds. That's exactly where I want to focus for this week's celebration. Let's start with cloud formation. This is what happens when warm air rising up from inside the canyon meets cooler, moister air. When I first began to plan for this post, three things came to mind. 1. "I wandered lonely as a cloud/ That floats on high o'er vales and hills," the opening of the Wordsworth poem that has absolutely nothing to do with clouds. 2. Joni Mitchell and these lyrics. I found additional ideas when I turned to my poetry bookshelf. Here are some favorite poems about clouds. Seed Sower, Hat Thrower: Poems About Weather (2008), written by Laura Purdie Salas, is a collection of weather-themed poems that are written in a variety of poetic forms. 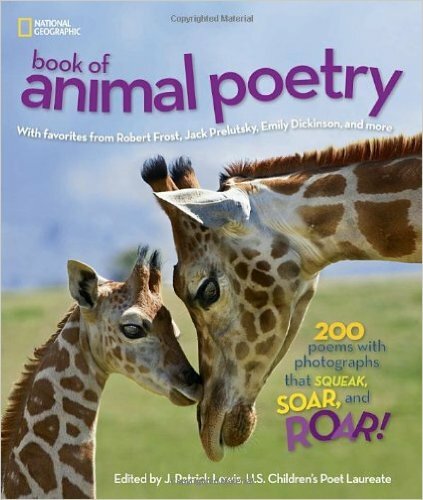 Each poem is accompanied by a splendid photograph. Here's an older poem (maybe 200 years?) by Percy Bysshe Shelley. 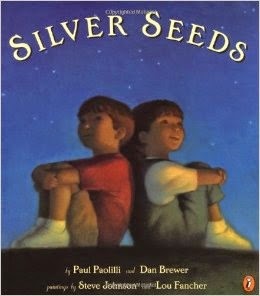 Silver Seeds (2001), written by Paul Paolilli and Dan Brewer with paintings by Steve Johnson and Lou Fancher, is a collection of 15 nature poems using the acrostic form. The verses are ordered to follow a young boy and girl through the day, beginning with dawn and ending with night. In between they encounter sun, shadow, hills, trees, leaves (though the word is leaf), a bee, butterfly, hummingbird, clouds, fog, rain, the moon, and stars. Poem ©Paul Paolilli and Dan Brewer, 2001. All rights reserved. Here's a lovely little poem by Christina Rosetti. 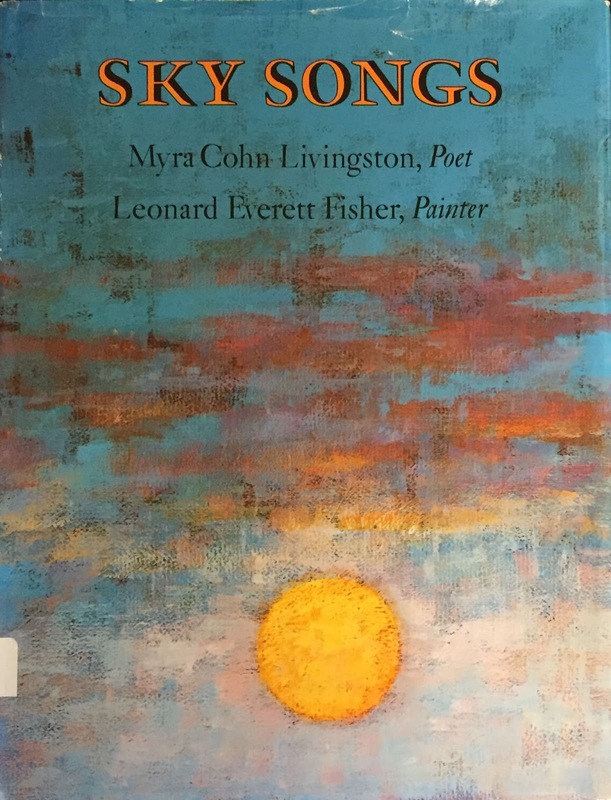 Sky Songs (1984), written by Myra Cohn Livingston and illustrated by Leonard Everett Fisher, is a collection of 14 poems about different aspects of the sky. 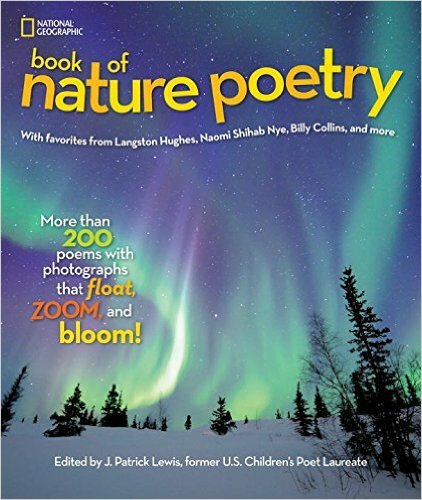 Poem topics include the moon, stars, planets, storms, smog, rain, and more. Poem ©Myra Cohn Livingston, 1984. All rights reserved. 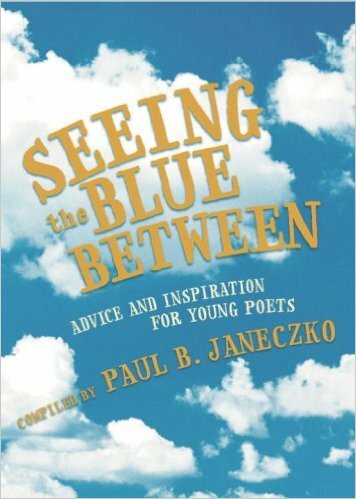 Seeing the Blue Between: Advice and Inspiration for New Poets (2002), compiled by Paul Janeczko, is a The title of the book comes from this poem which is about seeing the sky differently. Poem ©Kristine O'Connell George All rights reserved. Since reading this poem, I've never looked at the sky the same way again. Now I look at the spaces of blue and gray before I study the clouds. Let's wrap this up with an excerpt from a poem by Goethe. You maynot know this, but the German poet Johann Wolfgang von Goethe studied a number of scientific fields, including geology, mineralogy, botany, comparative anatomy, and theory of light and colors. His developed an in terest in meteorology after reading a paper by Luke Howard on the modifications of clouds (1803). Goethe embraced Howard's cloud classification scheme and eventually struck up a correspondence with him. Enamored of his work, Goethe wrote the poem "Howards Ehrengedächtnis" or "In Honor of Howard," in which he described different types of clouds using Howard's nomenclature and descriptions. The poem was published in German as well as in English in Goethe's journal on natural sciences. -Information found in the Proceedings of the International Commission on History of Meteorology 1.1 (2004). You can read the entire poem in the article Johann Wolfgang von Goethes Beziehungen zu Luke Howard und sein Wirken auf dem Gebiet der Meteorologie, written by Karl-Heinz Bernhardt. Don't worry, there is an English translation of the poem! April 23rd is Talk Like Shakespeare Day. On this day we celebrate the bard’s birthday (we think) and his works. Though there are no records of his birth, he was baptized on April 26. He also dies on April 23, so this day was chosen to honor him. Before I begin, I want to highlight a brand new book that everyone interested in language, words, idioms, history, and Shakespeare must read. 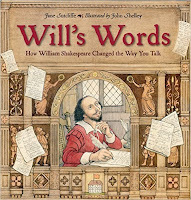 Will's Words: How William Shakespeare Changed the Way You Talk (2016), written by Jane Sutcliffe and illustrated by John Shelley, is a book about Shakespeare, his plays, and the words he gave us that have found their way into our everyday language. Each double-page spread includes information about the theater and the bard's world on the left side, with information on "Will''s words," what they mean, and where they come from. 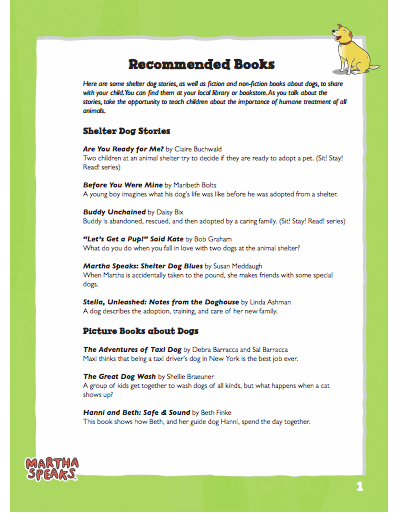 Backmatter includes an author’s note, a bibliography, and a timeline. This is a fabulous introduction to the time period, theater, Shakespeare, the evolution of the English language, and much more. What did spoken Shakespeare really sound like? Check out this piece at The Telegraph to learn more. This is for those of you who think Shakespeare isn't meant for kids. Speaking like Shakespeare can be as easy as slipping some of his phrases into your conversation. Here are few for which the credit goes to the bard. Kudos to you if you know the plays these come from! You can read more phrases attributed to Shakespeare at 45 Everyday Phrases Coined by Shakespeare. Can we attribute Knock-Knock jokes to Shakespeare? I think so! Here are a few Shakespearean knock-knock jokes for you. You can find more knock-knock jokes at Shakespeare Geek. 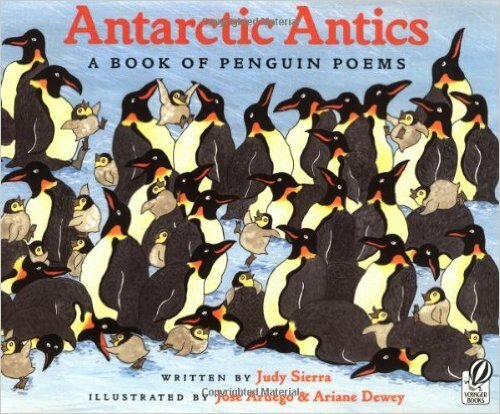 Here are a few poems and excerpts from plays that are particularly kid-friendly. I'll close with this hilarious version of Clarence's speech from Richard III. April 22nd is Earth Day. Earth Day was founded in 1970 by Gaylord Nelson, a U.S. Senator from Wisconsin. It was organized to "raise public awareness and concern for living organisms, the environment, and links between pollution and public health." As a result of Earth Day, many environmental laws were passed and the Environmental Protection Agency was created. Today, Earth Day is celebrated all over the world. Let's start with looking at NASA's campaign from last year. 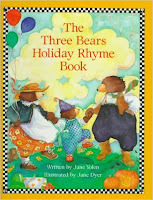 The Three Bears Holiday Rhyme Book (1995), written by Jane Yolen and illustrated by Jane Dyer, is a collection of 15 poems celebrating 16 different holidays including New Year’s, Groundhog Day, Valentine’s, St. Patrick’s, Earth Day, Arbor Day, May Day, Mother’s Day, Father’s Day, Independence Day, Labor Day, Halloween, Thanksgiving, Christmas & Chanukah, and Happy Birthday. Poem © Jane Yolen, 1995. All rights reserved. Earth, What Will You Give Me? Poem © Beverly McLoughland. All rights reserved. 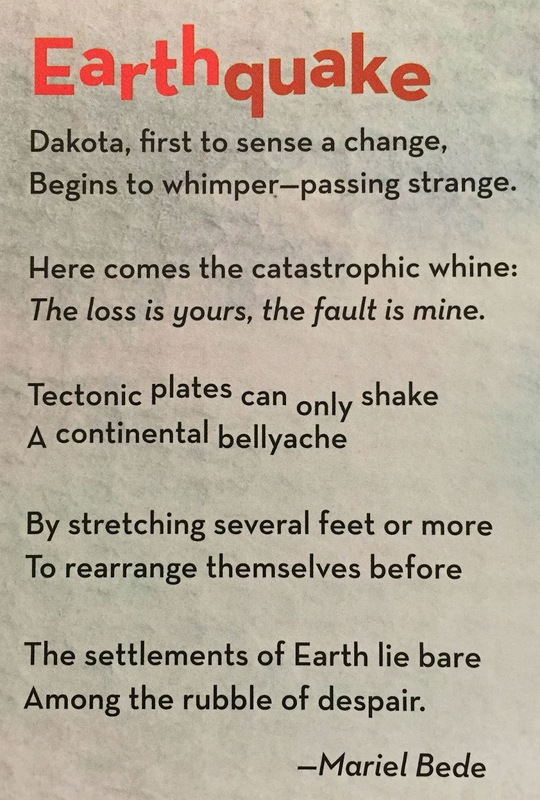 I'll wrap up today's celebration with a poem J. Patrick Lewis sent me for Earth Day. Poem © J. Patrick Lewis. All rights reserved. I'm still reading Auden and thinking this week about the intersection of poetry and science. Read the poem in its entirety. You can also listen to Auden read it. P.S. - Come back tomorrow for some fun with Talk Like Shakespeare Day! April 21st is Kindergarten Day. This day celebrates the birthday of Friedrich Frobel (born in 1782), who is credited with starting the first Kindergarten in Germany in 1837. This seems like a good time to celebrate the joys of play at school with a selection of poems about recess. Stampede! 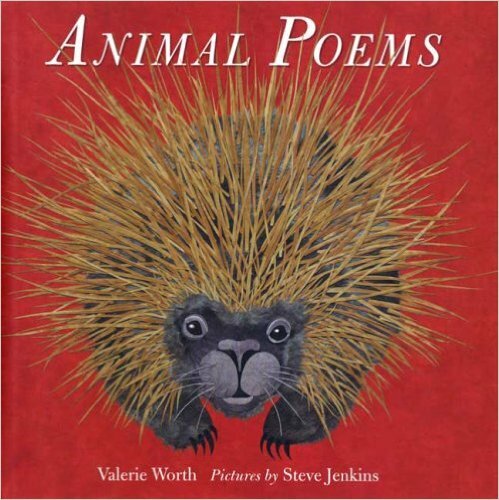 : Poems to Celebrate the Wild Side of School (2009), written by Laura Purdie Salas and illustrated by Steven Salerno, is a collection of poems that recognizes and celebrates the ways kids mimic the behaviors of animals. The poems are funny, clever, and clearly recognize the ups and downs of being a kid. In one wave, we fly the coop. We flood the field, we slide and loop. 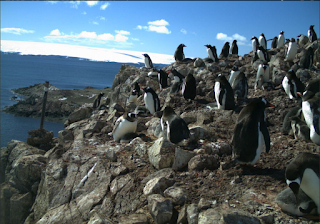 We flock together, shout and whoop. 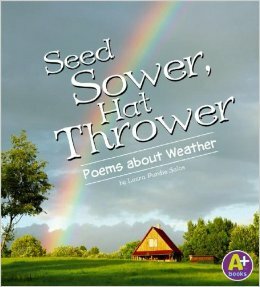 Poems ©Laura Purdie Salas, 2009. All rights reserved. 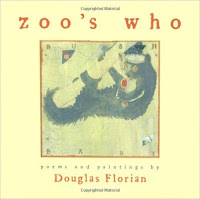 Messing Around on the Monkey Bars: And Other School Poems for Two Voices (2009), written by Betsy Franco and illustrated by Jessie Hartland, is a collection of school poems that takes readers on a ride around the school and schoolyard, beginning with the school bus and ending with the final school bell. 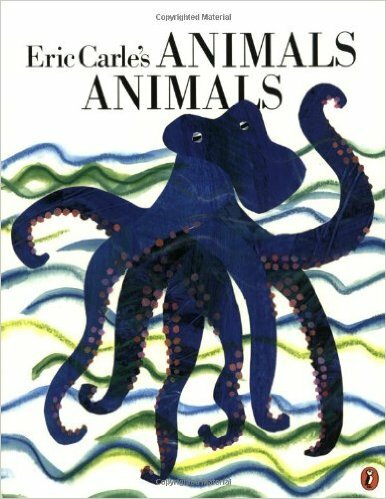 In the author's note Franco says "Though these poems can be read silently and enjoyed by a single person, they are the most fun when read aloud by two people." This is followed by a graphic that shows what the voices look like. In the poem below, the plain font is Voice 1, the bold font is Voice 2, and the larger bold font is for both voices to speak at the same time. Poem ©Betsy Franco, 2009. All rights reserved. For information on how to use this book in the classroom you can download a teacher's guide for Franco's book. I Thought I'd Take My Rat to School: Poems for September to June, selected by Dorothy Kennedy and Illustrated by Abby Carter, contains 57 poems that describe the range of experiences children have in school, from classroom pets, to school supplies, recess, mean kids, and more. Poem ©Lilian Moore. All rights reserved. 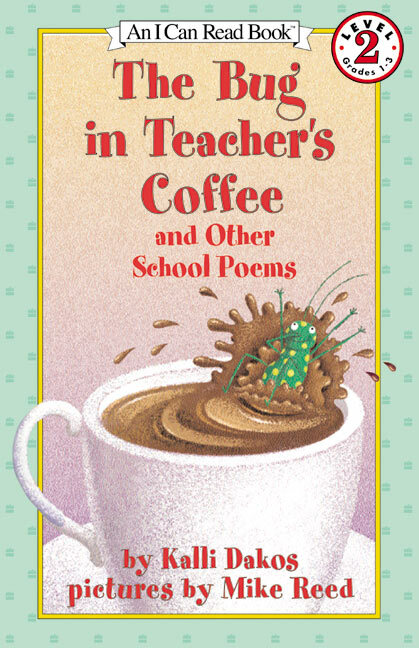 The Bug in the Teacher's Coffee: And Other School Poems (2002), written by Kalli Dakos and illustrated by Mike Reed, is an I Can Read Book designed to introduce poetry to children learning to read independently. 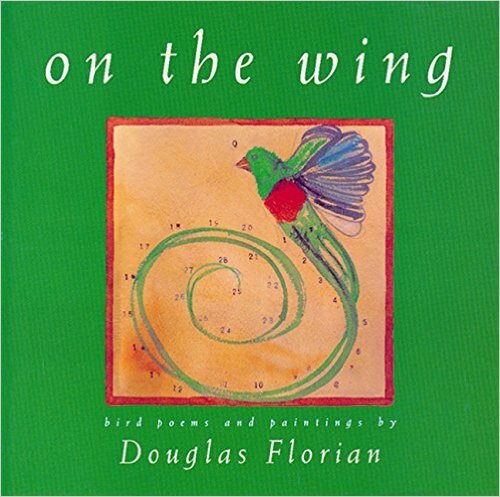 The mask poems in this book are short, rhymed, and full of bouncy fun. Poem © Kalli Dakos, 2002. All rights reserved. 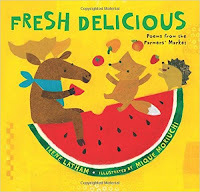 First Food Fight This Fall: And Other School Poems, written by Marilyn Singer and illustrated by Sachiko Yoshikawa, follows a group of children as they learn and grow over the course of a school year. 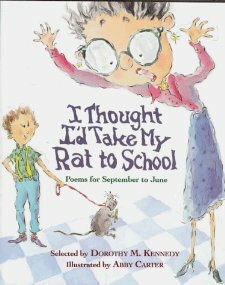 These poems are written in the children's voices and fairly sing about the highs and lows of school. What's most interesting is that readers will see how the kids grow and change over the course of the year. I'm the very bet at tag. It's my great claim to fame. I can zig and I can zag. I'm the very best at tag. my dog taught me the game. My classmates call me Snail. At tag, I'm always It. I wish they'd let me bail. I'd much prefer to sit. Hello School! 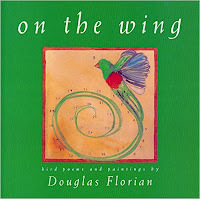 : A Classroom Full of Poems (2001), written by Dee Lillegard and illustrated by Don Carter, is a collection of 38 very brief poems for young children. 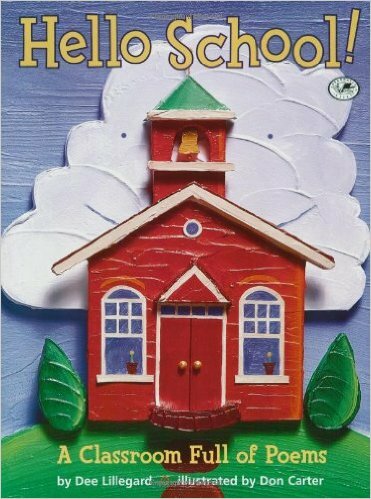 These short poems describe furniture, school supplies, and daily events in an early childhood classroom. stare at the sky . . . Poems ©Dee Lillegard, 2001. All rights reserved.